LP flies from New York to London. Letter from LP [signed in his absence by BW] to Mr. E. S. Proskauer RE: thanks him for the money for his review of the Rutger's book. Is willing that they quote his remarks on the quality of the text. [Letter from Mr. Proskauer to LP March 30, 1953] [Filed under LP Correspondence: Box #313, Folder #1]. 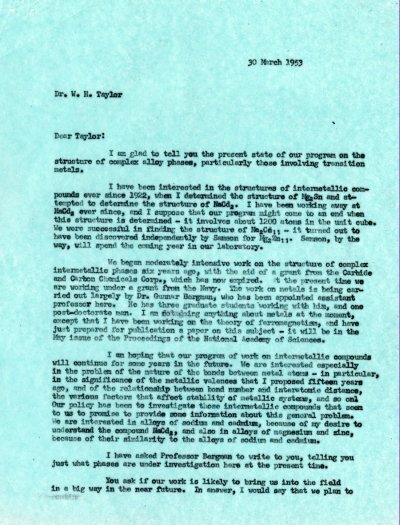 Letter from LP to W. Nowacki RE: writes that he has turned Prof. Nowacki's letter about M cards over to Professor Shomaker. Thanks him for sending a copy of his book on Fourier synthesis. [Letter from LP to Prof. Nowacki March 9, 1953] [Filed under LP Correspondence: Box #277, Folder #15: file (Nowacki, Werner)].